When Jude was learning to read, we tried a whole mess of programs, and by the time I heard about Reading Eggs, he finally seemed to have a grasp of things. Damien flew through learning to read before I could do more than remember it existed. When this opportunity came up with the Crew, I finally did a little investigating. I discovered that the company's offerings were a series of leveled programs, including one for both emerging and proficient readers, called "Reading Eggspress." We signed up for their standard two-week trial before I volunteered for the Crew review, to see if it was suitable for my "older" readers. 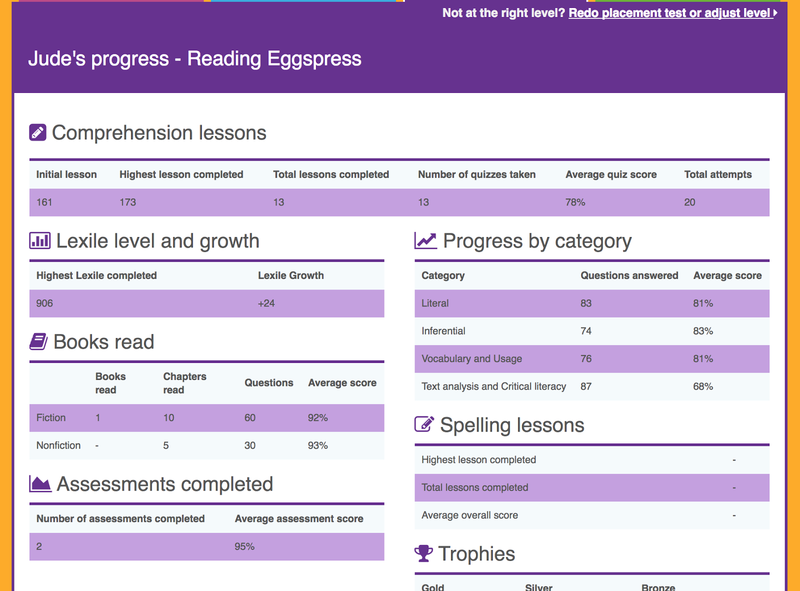 For our review, we received a six-month subscription to the full program that includes three levels of Reading Eggs plus their MathSeeds program. 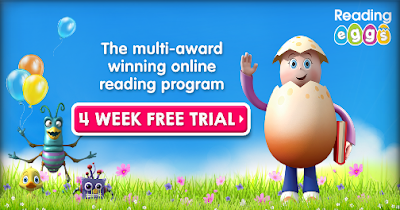 The complete program spans the entire pre-to-middle school gamut: Reading Eggs Junior is for the preschool set (ages 2-4), Reading Eggs introduces phonics and early reading (ages 3-7), and Reading Eggspress (ages 7-13) helps readers grow their reading and comprehension skills. If you're considering Reading Eggs, I would highly recommend giving it a try for the more extended period. I think two weeks in, we were still in a honeymoon period...a month in, we felt very differently about the program, especially for Damien. Each level has a placement test. When we did our early trial, Damien started with the eponymous Reading Eggs program. Although he has been reading for quite some time, I wanted to make sure he wasn't missing foundation skills. (Not impossible, because he raced so quickly through learning to read.) Since Jude was going to work on this the entire six weeks, I didn't push him to move on, thinking he would be a "bonus" kid in this review, and he took the Reading Eggspress placement test when we began our "official" month-long review period. 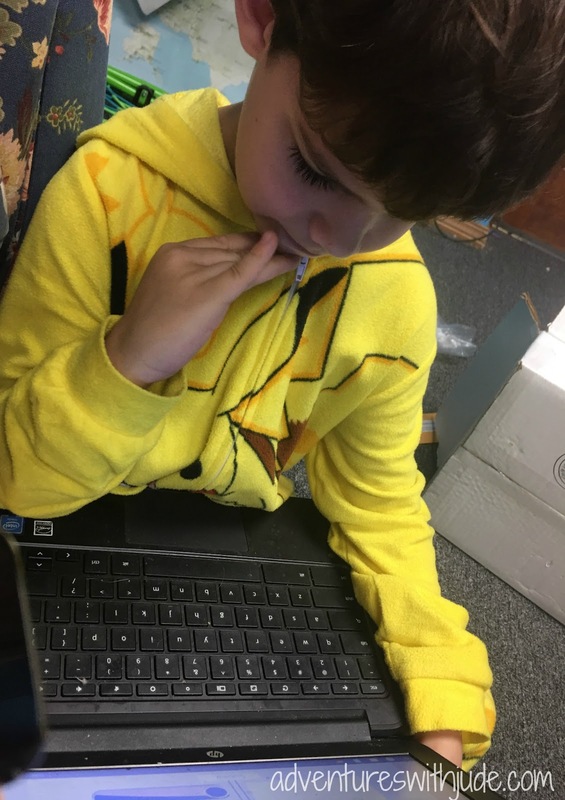 (Jude took the Reading Eggspress test during our trial, tested into and continued on with it) The placement test measures literal understanding, inferred understanding, critical thinking, and vocabulary. However, while Damien has maxed out for Reading Eggs, I think he is in over his head here. He placed into level 141 - the beginning of the "Year 5" level of the program. I was shocked -- I expected him to be closer to 3rd-grade level (which is still a year older than his chronological 2nd grade). While he did well with the testing (the only support I gave him was reminding him to slow down, to read all of the answers before choosing one, etc. ), he is really struggling with the program. He's been working for about a month, and he's only moved up through eight lessons because he's often repeating passages over several days. I like that if a student hasn't proved proficiency with a passage that he isn't permitted to just move on, but he's getting frustrated with repeating the same sections over and over. His scores are also not all that great. Our family standard of "successful" is 85%. I think a "B average" is well within my kids' capabilities, and in my experience, knowing 85% of something seems to be the cut-off between a reasonable foundation that periodic review will firm up and one that is closer to the precipice of crumbling. Damien's scores, even after repeats, are far lower than that 85% threshold. He tends to start with scores in the 60s, and then slowly build up after several repeats to the 70s. We have far more frustrated tears than we ought to. I think he would do better to move back down closer to a year 3 level, and then build up confidence. Jude, on the other hand, is doing fairly well, when he pays attention. Jude has ADHD and takes medication to help support his focus. Reading Eggs is a program that we have found needs to be done early, while the meds are in full force. He also often needs someone to sit with him and remind him to slow down, pay attention, follow directions, etc. When he's ON, he has 100% scores. When he's struggling to hang onto the ability to find details, he bombs. While his scores are below our "accepted averages" in several areas, I'm comfortable with letting Jude stay at the level he's at and continuing to move forward because his scores fluctuate so widely. When he struggles, he's in the 60s, but when he's focused, he gets 100s on the first go. While I was hoping that this would be a program he could work on independently, I'm not surprised that he needs extra help staying on task. There are a few things I wish were different within the program. First, while I like that each lesson includes a vocabulary section for the passages, the student is expected to choose three words from a list of five. The dictionary placement, pronunciation, part of speech, roots and derivatives, using the word, etc. are presented, giving a substantial word study. However, ALL of the words are included in the passage, and in later sections, the student may be left guessing what a word means if he didn't choose that word during the vocab section. 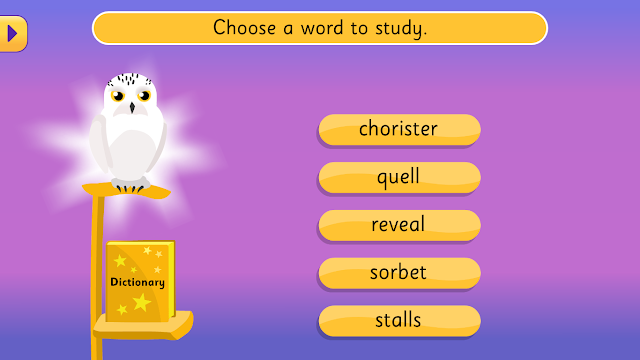 Here, Jude chose quell, reveal, and sorbet, but that left him to have to go look up the other two to continue the next section. I think three words at one time is a reasonable number to study, so I'd like to see a second vocab section visit so that the student gets exposure to all of the words. It was hard to fault either boy for incorrectly answering questions that hinged on the extra words -- he didn't know the word because it wasn't one he chose! 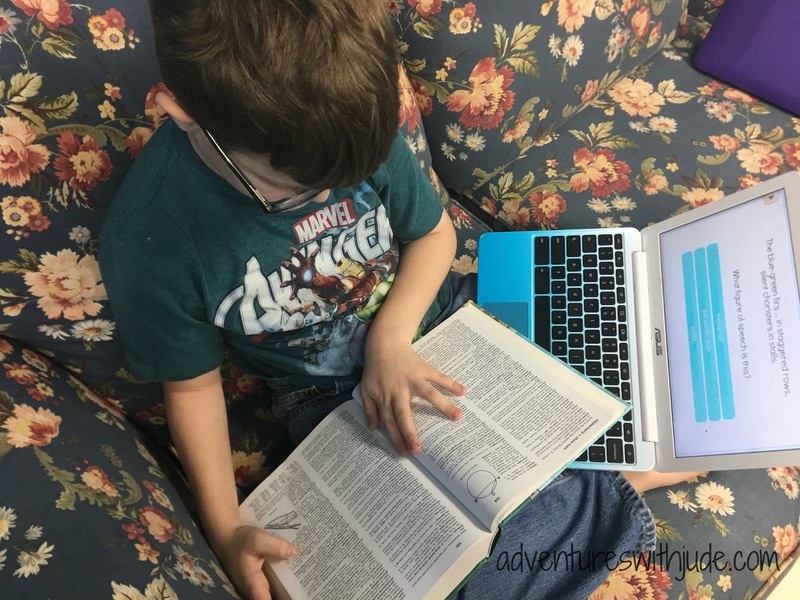 Yes, kiddo can go grab a dictionary (and often did), but then that defeats the purpose of a self-contained program. I also wish that it was easier to win trophies. It takes 1000 eggs earned in one calendar week. 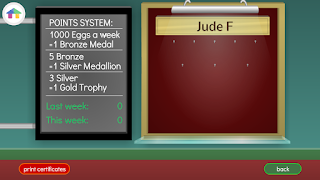 Doing one numbered lesson a day (10 tasks) during a typical school week gives them only 450 eggs; even adding a lesson on each of Saturday and Sunday would still leave them short. It takes the boys about 30-45 minutes to do a lesson; doubling up just isn't an option. While it's not a huge deal to me if they win a trophy or not, they are disappointed that they always seem to fall short. The last part of our subscription, MathSeeds, is a program for students ages 3 to 9. We didn't do any work beyond the placement test. It includes some geometry (plane and solid), addition, subtraction, and very early multiplication. Damien tested into level 131 of 144, but since he is already working at a 3rd-grade level, I skimmed ahead to see what else was being presented. His normal math program is skills-based, and he is already proficient in adding/subtracting through three and four digit numbers, which is what the program tops out with. I felt that this wouldn't be worthwhile for him to focus on -- review is never bad, but it just wasn't efficient for us. Though he's a just-turned-10, Jude is already working at a 6th grade level, so he didn't even attempt the placement. 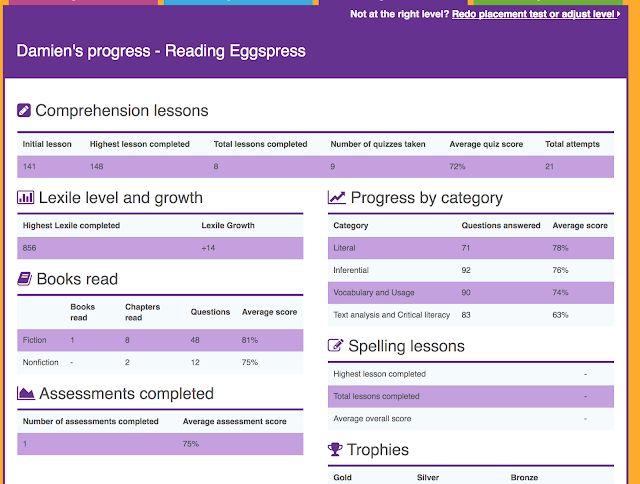 I was excited to finally try the Reading Eggs reading program. However, I'm not sure if we will extend our membership. I think that there are some tweaks we can try (adjusting levels, looking things up on our own, working together) but it's not what I had hoped it would be. I was really hoping that it would be a compromise between "I want to play on my computer" and "I don't want you vegging out for hours with YouTube videos." It's possible that with some adjusting it may turn out to be a success, but at the moment, it's not really filling the space I had hoped it would. 75 families are working with Reading Eggs. Click the banner below to read their reviews.